We had a very low-key weekend here. I had big plans of scoping out the D&R Canal and possibly running five or six miles of it, but with temperatures in the fifties, I decided it wouldn’t be worth dragging all the gear out. So while our friends competed in upstate NY at the Massena Dash, we were back in NJ, sweating our butts off at the Watchung Reservation. February is very early for our first hike of the year. The Watchung Reservation is only about 20 minutes from us and provides a very nice area to hike. This time of year, there’s not a whole lot of color. And with the recent weather, the trail was pretty muddy. Thank goodness AJ came along, as I’m fairly sure I couldn’t have hiked with all three dogs. 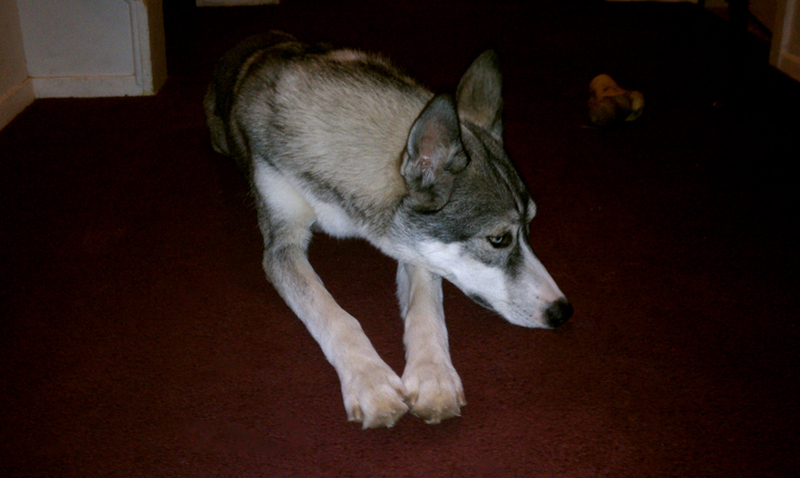 I started out with Dexter and Denali on a two-dog y-line and AJ had Knox. Since Dex was more than a little distracted, we decided to switch him with Knox. The pup needs some experience being attached to another dog via neckline, so I figured this would be a good opportunity. Holy crap, did he do well. The two of them took off with me stumbling behind them, trying to keep up. They made the uphill portions of the hike very easy… but downhill, forget it. Halfway through I ended up switching off with AJ. He weighs a bit more than me, so he could easily manage their pulling through the unstable terrain. 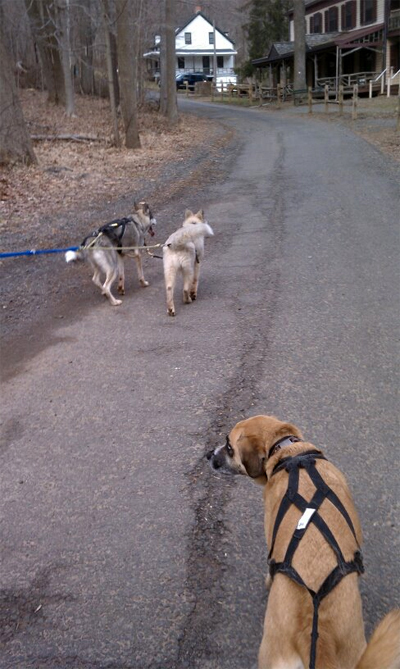 Dexter trotted around and did his usual marking and sniffing, but whenever AJ and the huskies got too far ahead, he got anxious and wanted to catch up. I’m hoping this will carry over to his in-harness runs, once Knox can join. Other than our hike, we didn’t do a whole lot. I made a make-shift flirt pole out of a branch and an old rope toy, so that provided the dogs with some entertainment. Knox is also working on his frisbee skills. He’s the only dog I have that will play fetch without getting bored, so I’m thinking I might be able to train him to actually catch a frisbee. We need something to do in the summer, after all. 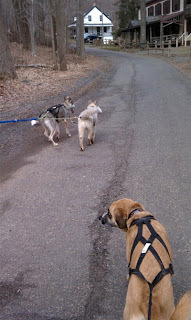 I included this weekend’s hike in our training mileage because the dogs worked their butts off. We’ve hit the 90 mile mark, so there’s no doubt we’ll hit a 100 before it gets too warm. I’m still hoping for a late season blizzard… I really want to get back on the sled. Even cold temperatures would be nice – Spring-like weather is pleasant and all, but not in February!